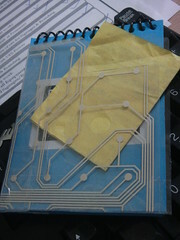 So I got hold of the motherboard circuit from an old keyboard and used it to modify a spiral writing pad last night. Yes, that is indeed a mother board / circuit. The yellow bit of paper is a dry-cleaners bill which I have kept tucked in that instead of in my bulging wallet - it also shows off the pocket better on camera. This also makes the notepad waterproof. The second snap shows the notepad resting on my keyboard with a pen inside. The actual pages are a nice bright blue, on which blue ink looks almost-black. I will soon try to make more versions now that this experiment has turned out decent. After all, lack of a smartphone means I'm back to paper and pen - but not without a little circuitry! Should'nt the cover be stiff? Looks like a regular paper cover..perhaps you should back it with stiff cardboard (old visiting cards would do). Re: Should'nt the cover be stiff? no, its plastic, and malleable. so not gonna back it with cardboard. 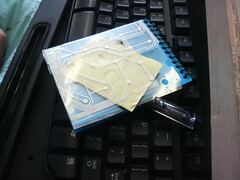 plus its already stuck on the notepad - and acts as a pocket for bits of paper. I guess the snaps make it look like paper, but physically its got small holes in it too (for the screws) - which u cant see in the snap. ^^ was thinking black, but yeah green will be good too. will get a green book/ bag/ item as base next time. Nice use of the circuit sheets! I would never have guessed the origins of the sheet :D But the circuit imagery gives it a very “techie” look. :D yeah - geeky look was aspired at!